Chocolate Thai anyone? We crossed the Pit with Crippled Rhino and got that old fashioned Buddha Stick flavor and punch. Unlike Thai however, this plant is finished in 45 days. Extremely potent with that blast from the past flavor. You wont want to miss this one. We crossed our Pit Bull on Crippled Rhino and got Crippit. 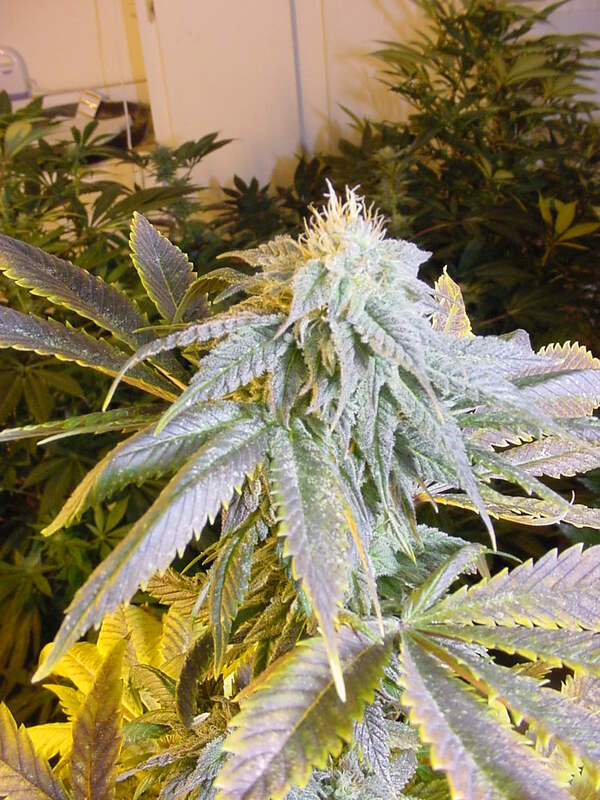 This heavy indica has a sweet exotic flavor and giant leaves with big chunky buds. It is a traditional “umbrella” plant. Even a little chill will turn her purple. She is delicious fresh, but curing really brings out the exotic flavor of the Chocolate Thai in her background. Type of high: Crippit starts out strong. You feel it immediately and it lasts for hours, it euphoric, dreamy, very cheerful, and a happy high. Taste/Smell: Buddha stick flavor, Crippit is outstandingly balanced, with a Thai top note and a Hawaiian base flavor that blend with a subtle floral. The leaves are very large and thick and wide with crystals down the fan leaves. They start bright green and turn a deep rich purple with a little chill. In the summer, she stays green all the way through.It’s sweet without being cloying. Big crystal coated fan leaves make great bubble hash too. We crossed our Pit Bull on Crippled Rhino and got Crippit. This heavy indica has a sweet exotic flavor and giant leaves with big chunky buds. It is a traditional “umbrella” plant. Even a little chill will turn her purple. She is delicious fresh, but curing really brings out the exotic flavor of the Chocolate Thai in her background.Great party bud. This is actually one of my all-around favorites. Crossing the Crippled Rhino with Pit Bull allowed us to take her outside. Crippled Rhino is more suited as an indoor Chocolate Thai strain, but the Crippit does just fine outdoors. We put it in bloom at about 4 to 4 and a half feet tall and it comes out between 6-7 feet tall. The buds are big and seem loose, but really are quite dense. They are long and large with lovely purple tones, especially if she gets chilly.This variety throws two primary colas and many secondary colas that are not quite as big. The thing that stood out the most about this variety is that it is a bit of a throwback in that it brought out the best of the Highland Thai genes from the Crippler, while still keeping the speed to harvest that we require. Thai in 6 weeks instead of 12. Crippit was released to the community in 2008. It has not yet been placed in contests. All photos for Stoney Girl Gardens are taken by Mike Mullins. Cripit is great for nausea; we definitely recommend this one to use after chemo. It’s a happy high so if you suffer from depression it is a good candidate to use. Cripit is not really a morning tea; it’s more of a night time use but helps great as a pain reliever.